These days, I move from one place to another, not only the place I lived, but also the place I worked. I am leaving the crowd, the groups of well known, the trend, the "network"... bird song replace traffic roar, wind breeze replace air conditioning, aroma of grass field replace ladies perfume, warmth touch of the sun replace halogen spots...just by chance, to take a break from melting into the "current flow", how lucky I am. I bring along with my aged ishuffle and all my working document, catch the train / bus, listen to my favorite songs, hour after hours, traveling towards my working site; looking outside from window, it is so quiet & so peaceful, time freeze? - what a big contrast to my past working pace, how come? Change - can bring you something out of your expectation, whether you want it or not, it can be a challenge, or a "dream" comes true. It seems my recent change brings me more time to think, to think deep, no hurry, no deadline. To me, I definitely need this refreshment before my next move, how about you? 一個夏午, 走進久遺了的上海街, 昔日繁榮不再, 只餘下寥寥幾間繡莊, 押店, 涼茶舖及麻雀館. 樓上茶居巳不復見, 上海食館, 百貨店皮鞋店也在逐漸消失. 曾幾何時這是一條十分有 "上海風"的街道, 不少洋貨及高品質的國貨衣飾也能在這裏找到. 每逢夕陽西下之後, 華燈初上, 踏進這條街, 總會有種走進異國夜市的感覺.紅紅黄黄的繡莊招牌, 店舖愈大招牌愈是搶眼. 洋傘也好, 綢緞也好, 甚至花式多多的暖水壺也是一些有質量而市民又能負擔的優良產品. 今天, 我們收入水平高了, 但一般人能夠負擔的貨品, 質量卻相對下降; 就連居住環境, 空氣質數, 生活節奏也隨之而改變, 或應說是犧牲. 對於從未有機會接觸過那個時代的80/90後來說, 每天只能擠進愈來愈沒有特式的鬧市街頭, 又或是千遍一律, 毫無生命的商場來說, 實在可惜; 不過, 也許至少比我們只能懷緬的人心理上活得輕鬆. 你呢? 會選擇做那一個年代的人? 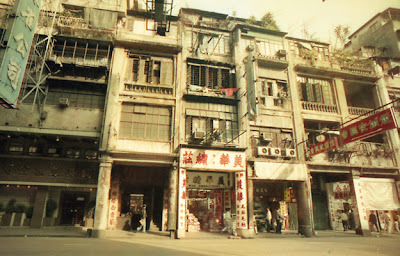 Afternoon, in Summer, once I've been step into this street - Shanghai Street, in Hong Kong. Oops, what a colour tone of the past, the colour of wash out. Only a few fabric shop, ma-jong shop& Chinese herbal tea shop were found; Cantonese tea house up stairs, Shanghai restaurants, Chinese department stores, book stores were gone, ...all gone. It was once a street full of Shanghai culture, lots of imported daily goods could be found here, well, in high quality of course, even though they were from mainland China at that time. Whenever the twilight falls, neon sign flash everywhere especially the red & yellow one for those fabric shop, which sale high quality silk, damask or tailor made wedding wear; the larger the signage, the larger the shop. I still remember, living in those years, we could buy affordable good daily stuff, like umbrella, thermal vase, black leather shoes, a "heavy" duty cotton blanket + salted Chinese ham to wait for the Winter to come. " A foreign night market" was the picture in my memory. Today, we earn more, but our living standard drops, how come? not even we have to pay more of having an up to standard consumer product; we sacrify our living environment, air quality or even life pace. For those who can only be part of the crowd in our liveliness district or shopping mall, the 80's & 90's, it is a regret; but compare with us who know the past and can only be a chase in memory, which era will you prefer to be? 香港是一個人囗密集的地方, 很多人也住在一個小蝸居, 空間的限制卻一點也沒有影響人們收藏至愛的嗜好! 毛公仔丶動畫角色手辨、香水仔丶漫畫書、CD丶模型車、飛機仔...等等, 各式其式; 可有想過收藏顏色筆? 有玩收藏遊戲的朋友可能也會定時定候到Felissimo逛逛, 這裏有按月從日本寄出的可供收藏物品, 由柸碟剪貼圖案, 衣物飾物以至雨傘裝飾繩簾等, 一般要三個月至一年才可集齊所有款色, 而想擁有這500支有名有姓的木顏色便要花上20個月, 每月收到25色...嘩!可真要有相當的耐性啊! 有趣的是每支顏色也配上一個美麗而引人幻想的名字, 如:"雨後的八仙花", "南極的黎明女神", "南非的紅鶴", "鯉魚飛躍的天空"...你能想像它們是什麽顏色嗎? 也許在家中擁有這幅"顏色掛畫"並不比一幅名畫或水晶吊燈來得豪華, 但擁有500個由顏色引發的幻想可不簡單, 你可曾有過到南極看黎明的夢想嗎? 夢想, ...我有,也許不止500個, 你呢? 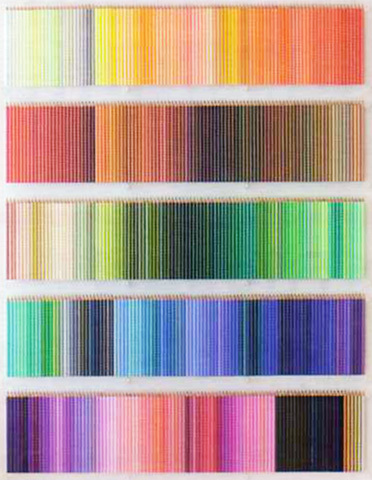 What is so special of collecting color pencils? How about a total of 500 pieces? Or every month you've only got 25 nos. meaning you need to wait for 20 months? And how about they've got their own beautiful names. "carp in the sky" "hydrangea after the rain" "aurora in the South Pole" " flamingo of the South Africa"... can you imagine what their actual color is? Dream, I have too many, may be already over 500, how about you? 上月初曾在電視看National Geographic, 剛剛介紹十張由編輯們揀選的年度優秀作品, 也許節目是重播關係, 這巳是2009年的事, 但相片內容一點也不過時. 從來都知道National Geographic 的相片出色, 尤其以紀錄式的相片. 基本拍攝技巧巳不容置疑, 但他們的攝影師所拍出的照片, 總令人有點心動, 甚至乎震撼的感覺. 上面一幅是由一位女攝影師Amy Toensing 在一個報道澳洲Murray Darling Basin 旱災時所拍攝的一幅照片. 相中的人物並非特約演員, 只是接載他們採訪的一個家庭, 一切就這麽自然地發生而在瞬間而被作者攝入鏡頭. 在節目中, 我們可以從評審口中得知多一點關於這幅照片優秀之處, 但其實相片巳把一切說明......其他內容留待觀眾自己去感受和聯想......這就是我們認為相片優劣的其中一個要素. 誠意推介大家登入National Geographic Photography 的網頁, 欣賞更多優秀的作品之餘, 也同時擴闊我們的攝影世界. There was a National Geographic T.V. show last month, seems a replay of the Best Top Ten Photos of the International photo contest in 2009. A very good show, not only the amazing photos and photographers, but more detail analysis of the story behind. 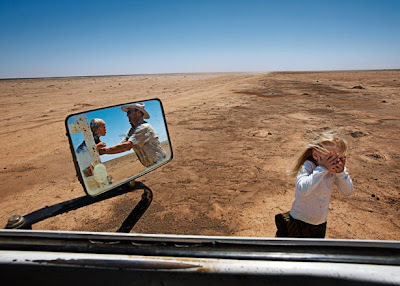 But truly speaking, neglect all of the technical know how that those photographers are familiar with, their photo tells story......that capture our heart and emotion. The photo above was taken by Amy Toensing, who was asked to report the condition of Australia's Dry Run, there, is Murray Darling Basin. Everything in the photo was captured naturally happened at that incident, no actor, no props...but again, it tells the story,audience are free to explore within......we think, this is one major core of a good photograph. you can enjoy more brilliant photos and at the same time to explore in the photo world without boundary.